The city in question is actually Copenhagen. Which is why it piqued my interest. You mean Copenhagen has a congestion problem? I thought they were the model we were supposed to be following. It has all those bicycles – and the space between the buildings is dealt with properly. People can not only walk they can also sit outside if they want to. But they still have congestion? Partly the answer is of course they do because congestion is not so much a problem as evidence of success. Detroit does not have congestion any more. Moreover, in a flourishing city, traffic expands to fill the space available and congestion occurs at the times when most people want to travel. That is why traffic engineers and transport economists spend so much effort on peak hours and the journey to work. Indeed if congestion is just the banal observation that it takes longer to drive when everyone else does than when the roads are empty, it is a pretty pointless pursuit trying to “cure” it at all. Something Todd Littman has dealt with far more effectively than I could. There is no magic bullet, but there is a set of approaches which can be adapted to the needs and geography of places – which are all different. No single solution or technology solves every problem – and not all “problems” are going to be completely resolved. We can, however, aim for better solutions and compromises which dissatisfy everybody to the least extent possible. So what this article identifies is a set of schemes to serve areas which do not have the sort of public transport mode share as the rest of the city region. In fact it is the same problem we have. Copenhagen has a metro and all day, every day, bidirectional passenger rail services. I have to use that awkward phrase in case any of my readers still think “commuter rail” exists outside of a few North American cities. The reason they get 25% of the trips made by the population living near stations on trains is that there is a service all day and every day – and it goes to more than one destination. Actually that in itself is a significant figure. What do you think they do for the other 75% of the trips? Yes bikes will take care of some of it, as will walking but most will be in cars. And these light rail lines are proposed for the areas that only get a 5% mode share for transit – just like most of our region. I think it is also significant that the entire article has not a single money figure in it anywhere. If you tried to write a newspaper piece about transit here, someone is bound to ask “How much is this going to cost?” and “Who is going to pay for that?” (which actually means “not me!”) What it does stress is the importance of the network – and of selecting the ” best value corridors that the city ought to prioritise” – which sounds familiar, doesn’t it? “political opposition and questionable profitability could derail these and other proposed light rail lines” – is that Copenhagen or Surrey vs Vancouver? Except here no-one would use the words “profitability” and “transit” in the same sentence. It also points out the silliness of thinking in terms of some future point when the present set of schemes have all been realized as an end state. It isn’t, and never will be, because there is always going to be more to do. The important thing is chose the right direction to go in. That was something we had done once – the Livable Region Strategy – which was not perfect by any means but did make the priorities clear. And then the provincial government simply ignored it and went on doing what it has always done – built more and bigger freeways. If those resources had been devoted to transit network expansion, we would be looking at a different set of problems – but we would not have solved them all. Let alone “cured congestion”. But then we weren’t trying to. We were just aiming at “increased transportation choice” – which was expressed as a target transit mode share at various dates into the future. Except that the mode share target was always 17% of all trips and the years just kept being put off into the future. I understand that the Mayors and the Minster are now sitting down and trying to come up with some funding proposal for Translink. Presumably something that she can flourish on the eve of election day. Yawn. “Win” meaning “win elections”. Free enterprise has also brought us ocean gyres full of plastic waste, global warming trending well beyond 2°C, unaffordable housing and persistent homelessness, the crash of 2008 … the list is endless. When they “win” everybody else loses. Just to raise the sights a little, light rail, often promoted here as the solution to all our transit concerns, is proving far from problem free in Seattle. Noise is a serious issue – and they are working hard to do something about it. Surface light rail does have impacts on its surroundings. Indeed, it would be foolish to think that any technology has no impacts at all. Wind farms look very good in comparison to off shore oil wells these days, but are still a threat to birds. Transit contractors installed lubrication machines to reduce screeching on curves. The biodegradable gel automatically is squirted on the rails, where wheels pick it up and spread it near Mount Baker Station. The lubrication is helping somewhat, and Gray said one lube point will be moved closer to the Beacon Hill Tunnel soon. 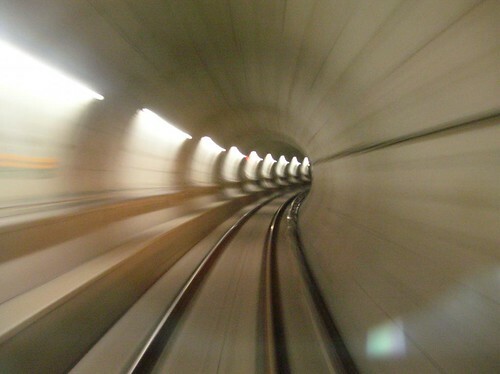 Since the squealing only occurs inside a tunnel there are no neighbours to annoy, and I suppose that users of the Canada Line are expected to simply tolerate it. It does not happen on SkyTrain since the trucks under the cars have steerable axles. I don’t think that is an option with conventional traction motors which tend to be hung on the axles on most electrical multiple unit trains. But I would also think that since the noise is created by metal grinding on metal that is must have cost implications in track and wheel wear too. Skytrain has run its course; LRT is the way to go. As a former premier of British Columbia, mayor of Vancouver and city councilor, Mike Harcourt helped British Columbia earn its reputation as one of the most livable places in the world. His focus on conservation and sustainable development – and his resolve to contribute to the transformation of cities and communities around the world – has played a significant role in promoting quality of life for those in Canada and abroad. After stepping down from politics, Harcourt served as a member of the National Round Table on the Environment and Economy, where he served on the Executive Committee and Chaired the Urban Sustainability Program. He was a B.C. Treaty Commissioner, and he was chair of the Prime Minister’s Advisory Committee for Cities and Communities and he co-chaired the National Advisory Committee on the UN-HABITAT World Urban Forum. Harcourt also chaired the Directors Selection Committee on behalf of Mayors in collaboration with Translink and B.C. Ministry of Transportation. He is Honorary Chair of the International Centre for Sustainable Cities, and Co-Chair of the International Panel of Advisors. Professor Patrick Condon has over 25 years experience in sustainable urban design; first as a professional city planner and then as a teacher. He started his academic career in 1985 at the University of Minnesota, moving to the University of British Columbia in 1992, acting first as the Director of the Landscape Architecture program and later as the James Taylor Chair in Landscape and Livable Environments. As Chair he pioneered multi party sustainable community design workshops now generally known as charrettes, starting in 1995 with the seminal Sustainable Urban Landscapes Surrey Design Charrette. He has been instrumental in establishing the highly successful Smart Growth on the Ground charrettes with Smart Growth BC and is currently focused on the Sustainability by Design project, a vision for a sustainable region of 4 million. He is now a senior researcher with the UBC Design Centre for Sustainability, an urban design think tank that evolved from the original efforts of the Chair and now employees over a dozen researchers. If you read the comments on this blog you will know why this gets posted here. It is apparently one of a series called “Langara Dialogues” and it is suggested that you get there early to ensure seating. The Province today has a surisingly positive approach to the re-opening of the old BCER Interurban line. Last Monday, however, visiting rail expert Brent Graham from Melbourne, Australia, advised Langley Township councillors to go for light rail in a big way. “Visiting rail experts” are always worth listening to. The fact that resident rail experts have been syaing this for years counts for nothing. And of course the real problem is that Kevin Falcon “knows” it won’t work – and has all kinds of reasons why it will therefore not even be tried. The fact that he has tied hos political future to widening the freeway is merely coincidence. Paris – what do they know that we don’t? The €650 million ($1.02 billion US) project will include new 25 stations from Porte d’Ivry to Porte de la Chapelle, of which 13 will have transfers with a Metro or RER lines. The line will require 22 new train cars costing €67 million ($105 million US). The city will invest €137 million ($214 million US) in urban landscaping along the tram’s corridor. The whole package that Wired describes costs half of the ridiculous Canada Line. 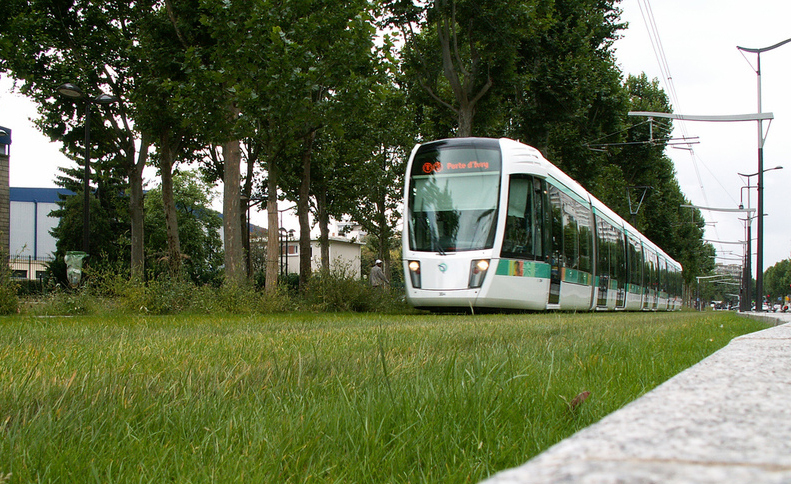 The image shows a long tram running on a reserved right of way with grassed track. In other words what could have been put into the Arbutus Corridor easily and cheaply with no disruption to anyone. Certainly not one business would have needed to close. And the length of the trams and the frequency of service can be readily adjusted to meet needs. The Canada Line has short trains which cannot be lengthened without rebuilding all the stations, most of which are underground. Its frequency will be restricted to the time it takes a train to negotiate the last half mile of track (Lansdowne to Brighouse) unload, reload and then run back. That’s what cheaping out on single track gets you. And of course both branches will have to interleave service adding more delays and lowering service standards as the people of Surrey discovered when the Millennium Line opened. But of course when we need to carry a fraction of what the Parisian trams carry, our provincial government thinks it makes sense to put yet another tunnelled system through Point Grey at a cost of over $2bn! I hope a resident of the west side of Vancouver or along the new Evergreen line will give me one good reason – and the need to transfer is not an overwhelmingly convincing one – why a system like the one illustrated above is not acceptable in their area. I would also like someone to defend the idea that we cannot even consider a system like this for the Fraser Valley for another thirty years! I have written about dmus on existing tracks before – and this project in particular. It opened, finally, yesterday. Sunday’s launch marked the culmination of 30 years of planning and development, at a cost of $478 million. The project was funded by a combination of federal, state and local funds, including the county’s ½-percentage-point Transnet sales tax. About two dozen passengers on the first train were employees or friends of North County Transit District, the developer of the 22-mile rail line, but most were just local folk who wanted to ride history. That is why I think surface light rail on existing tracks with diesel rail cars should be the starting point for rail rapid transit. If you have no existing tracks and a lot of road space (King George Highway is a good example) then convert two of the general purpose lanes to bus only. That is even cheaper. Of course, you will have to enforce the bus only lanes but the easy way to do that is ban parking on street altogether, and fit the buses with a camera in the nose and a button for the operator to push whenever a car gets in the way. And you can also set the traffic lights to turn green for the bus. That is all very cheap indeed. When you have a low market share and not much money, building grade separated, computer controlled, gee whiz systems makes no sense at all. Incremental growth building on what you have makes a lot more sense. OK Malcolm. You take over from here.